Standing right there all by itself on the empty foundation that had been swept clean by the horrific winds. Just a few pieces of plywood and 2×4’s in an upright position. Yes, that’s right. A prayer closet. 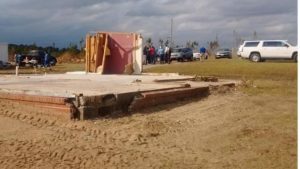 A few weeks ago deadly tornadoes ripped through Alabama. But the calm after the storm found this amazing site. Standing on the foundation, all by itself, was a grandmother’s prayer closet. It and the whole family survived this tornado. How in the world? “My God is awesome!” posts a member of the Billy Graham Rapid Response team. Yes, our God is awesome. That’s how. Never, ever give up hope. Never, ever stop praying. God is working, even in the middle of the storm. Go to your prayer closet and ask Him to sweep away the devil and show Himself in a mighty way. Shine, Jesus, shine! This entry was posted in devotional, inspirational, motivational, spiritual on March 25, 2019 by Deanna Young.